I had a great experience on my campus tour during my first visit to Augsburg. While watching my guide interact with other students on campus, I noticed a sense of community here. I feel at home when I’m at Augsburg. I also enjoyed not having to walk far for class since Augsburg has such a small campus. Faculty. Professors at Augsburg are more than willing to give their students extra help. They go out of their way to build great relationships with students, staff and other faculty. My friends and I frequently had “game nights with Joan”, one of our favorite professors. What experience best prepared you for graduate school? My experience as a student in the URGO Summer Research Program helped me become an independent researcher. 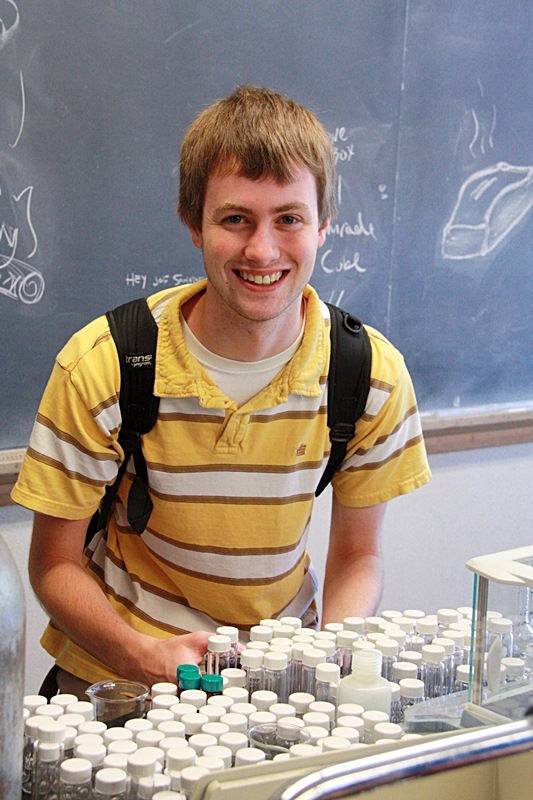 During that summer I got to know my way around the lab and I found out how much I enjoy working with nanoparticles. Before working with Dr. Vivian Feng, I hadn’t even thought about working with nanoparticles. Now I love studying nanomaterials. In my lab at the University of Minnesota, I am studying drug loading and release using mesoporous silica nanoparticles. This involves synthesizing different types of mesoporous silica nanoparticles as well as quantifying the amount of drug they can hold and the kinetics of the drug’s release. Tell us about the photo of you and the first lady. I was able to meet the first lady as part of the Wallin Education Partners Program. The program had some tickets donated for her fundraiser event at the Walker Art Center. The staff at Wallin Education Partners chose students whom they thought exemplified Wallin scholars to meet Michelle Obama and get their picture taken with her. After the photo op, we had the opportunity to stand near the front during her speech. What was the most difficult part of your transition from high school to college? I didn’t think that the transition was that hard. Augsburg is 25 minutes away from my home and I was accustomed to the city. However, I remember being afraid that I wouldn’t make any friends. I bought a flat screen TV my freshman year in an attempt to build my friend group. I don’t even watch TV. Befriend your faculty. Stay involved, but do things that you enjoy. Personally, I wish I would have gotten involved in ACS (Augsburg Chemistry Society) my fresh-man year. Instead, I tried to do what I thought the ‘cool’ kids were doing. This summer (2013) I am doing a rotation in a chemistry lab at the University of Minnesota. The PI has guaranteed me a place in the lab, so if I enjoy my time there this summer I will already have a permanent lab when school begins. In the fall I will start my graduate course-work while continuing my research. I ultimately want to be in charge of an industrial lab so that I can work with the new students to teach them lab techniques while also being able to do re-search. At Augsburg, I loved working with small groups of students to teach them concepts they didn’t understand, and I feel like this would be a good way for me to combine my love of research with my love for teaching small groups. That’s my ultimate goal. Do you have a question for Joe?